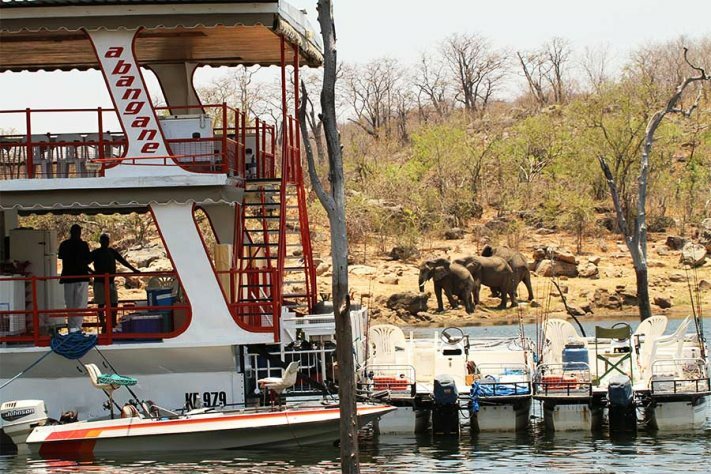 The Abangane is the most reasonably priced houseboat (that is worth going on) you will find in Binga, on the western end of lake Kariba. There are no frills and spills that one gets with the luxury houseboats (like aircon and luxury cabins), but this boat is clean and practical and has all the amenities that one needs for a few days on the Lake. It gets you out there at the right price and you won't be uncomfortable. What I particularly like about this houseboat is that they have done away with the traditional tiny and incredibly hot cabins normally found on houseboats in this price bracket. These small cabins are so cramped, hot and stuffy that people would rarely sleep in them preferring to sleep on the much cooler upper decks, just using the cabins as change rooms. The Abangane houseboat has kept two decent sized cabins each with a couple of bunk beds (in case someone does want some privacy) and plenty of storage place for your clothes. With the extra space created they have made larger shower rooms and toilets. Clean bathrooms are important to me which is why I like this boat so much! So most people sleep on stretchers on the open upper deck - good thick mattresses, linen and mosquito nets are provided. There are drop down blinds all round (upper and lower deck) to shelter you in the event of heavy winds or rain. 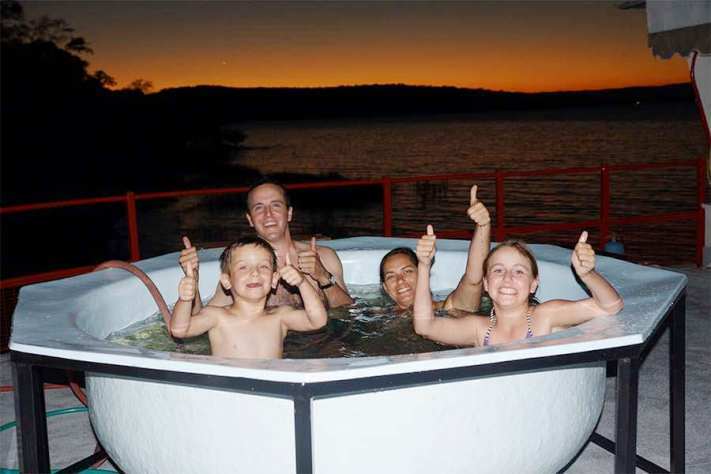 The Abangane is one of the most affordable houseboats, clean and spacious for a satisfying holiday on Lake Kariba. • Most passengers sleep on mattresses under mosquito nets (provided) on the upper deck. • The boat is registered to accommodate 15 passengers (12 is a comfortable number) plus a crew of 3 to 4. Consist of crews quarters, storerooms, 2 cabins/changing rooms with 4 bunks, 2 shower rooms, 2 separate toilets and a fully equipped kitchen, which include electrical appliances, a gas stove,2 fridges and 3 deep freezers. A shower is situated on the Bermuda deck. Approximately 75% of the spacious upper deck of the Abangane houseboat is under cover and contains a bar with bottle cooler and ice making machine and the counter doubles as a cosy meal table. Most passengers sleep under mosquito nets (provided) on the upper deck. 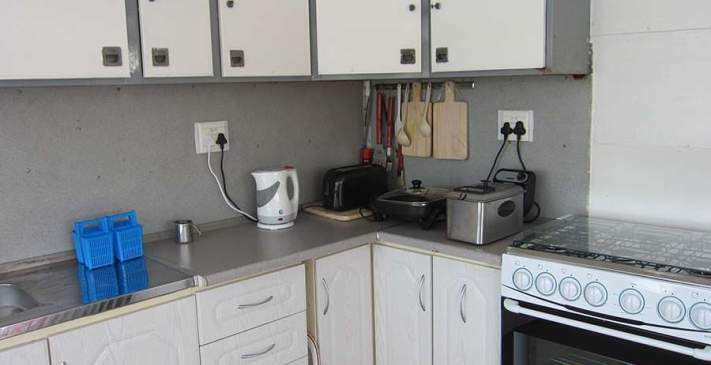 Two freezers are situated on the deck and a large gas braai (barbeque) unit complements the cooking facilities and provides sociable meal preparation. Generators provide 220 Volt electrical power to operate fridges, freezers, a hot water geyser, a washing machine, fans and plug points and charges the batteries to service the 12 Volt lighting system. An inverter ensures that the iPod dock (supplied) and fans work when the generators are switched off. Two twin hulled tender boats powered by 25HP Mariner outboard motors are towed by the boat to allow access to shallow waters for fishing, and game and bird viewing. Please treat them with care. 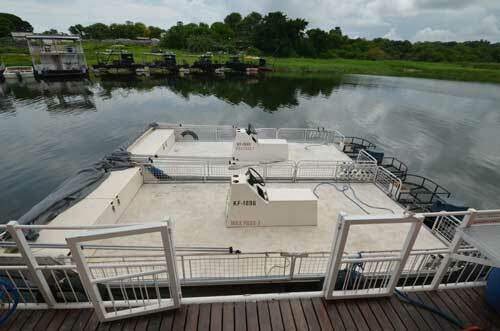 Passengers may bring their own tender boats, but only 3 boats may be towed by the Abangane houseboat. The Crew A captain, cook and one or two crew members will attend to all your needs. Please advise them of your daily routine, ensure that they get a rest period during the day and are not kept up too late at night. Laundry There is no laundry service on the boat, but the crew will assist should it become necessary. Drinking water is filtered, but not chlorinated. You may wish to boil the water, bring chlorine tablets, or buy bottled water. Drinking ice (chlorinated filters) is made at the bar, once the boat has exited the harbor and water can be drawn from the open lake. 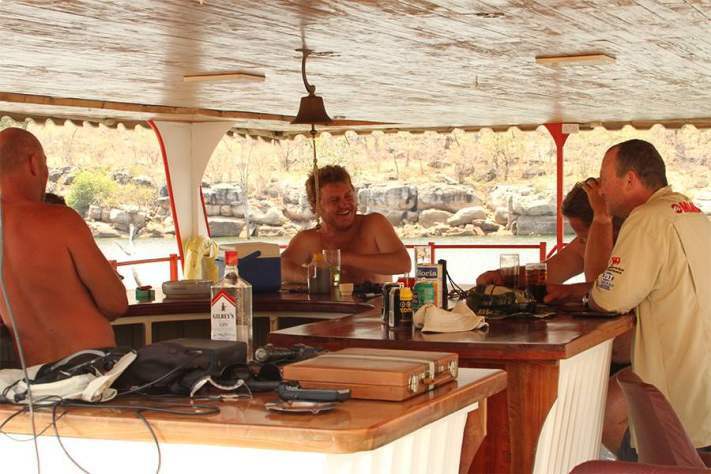 Gratuities are entirely at your discretion and should be related to good service which we are confident you will get on the Abangane houseboat. - Should be from 12.00 noon on the day you arrive and disembarkation should be before 09.00am on the day you leave. A limited number of basic fishing rods and reels are available for guest use. Each raft is equipped with a worm box, landing net and a keep net. 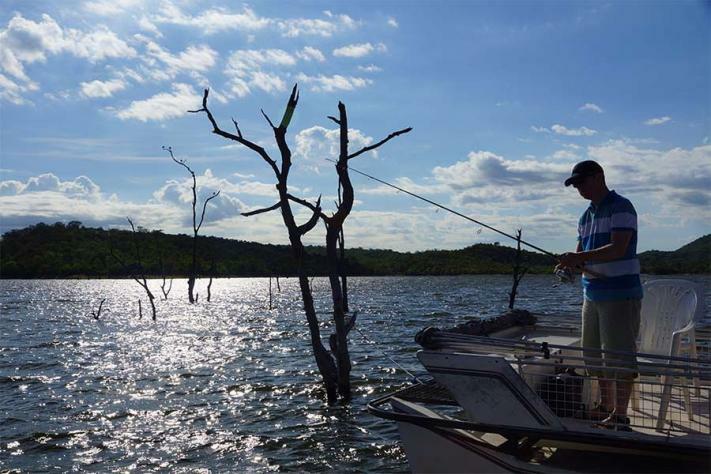 You should bring your own fishing rods, reels, tackle and your own bait. Worms may be purchased from vendors outside the Bulawayo city hall and you should try and obtain 3 or 4 packets of dry and selected fresh kapenta (the crew can assist when locally available) for Tiger fishing. Bait is offered under the full catering option. Please use the small safe facilities in the bar provided, and bring your own padlock and key. There is a small well-equipped first aid box for emergencies but you are advised to bring your personal medications such as hangover pills, antacids, antiseptic ointment, stomach remedies and sunscreen. Mosquito repellent sprays or ointments are essential requirements. 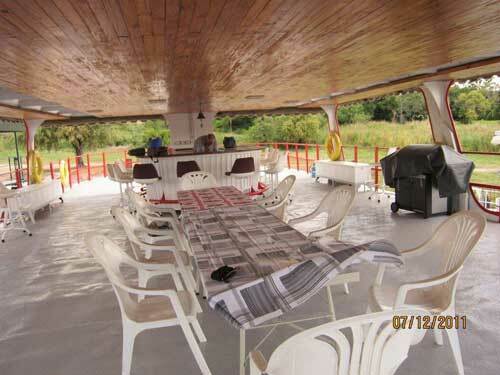 The Abangane houseboat can be hired either on a fully catered basis or a self catered basis. Menus can be arranged within a weeks notice. The boat and fridges will be loaded with fresh provisions the day before you embark. Beers, minerals, ice blocks and fishing bait (masese, worms and kapenta) can also be loaded at extra cost under this option. The above suppliers can load the boat with groceries, beer, minerals, ice etc on the afternoon prior to embarkation, if requested in advance. Bring your own delicacies, meats or drinks that may not be obtainable from a rural superette. Cost of charter is US$563 per night, but is subject to review and change at short notice, as circumstances dictate. (Excludes diesel) See cost example below. • 40 litres of Petrol and 2 stroke oil for tender boats are included in the charter fee. Additional petrol and oil used will attract additional cost. • Generator Costs - Costs for 9 hrs running time per day are included in the charter fee. Additional usage attracts additional cost. • Diesel is based on the destination you choose, as detailed in the table below. Other destinations will be priced upon request. Elephant Bay is normally used as the final stop on the return trip. This ensures that you arrive at Binga for disembarkation by 09.00am the next day.